Note: Pipeline Inspection is only available for Spark data Pipelines. To view and edit Pipeline Inspection options, navigate to the top-right corner of the data pipeline canvas and click on the eye icon . 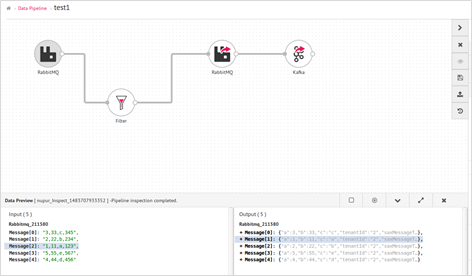 Once the data pipeline inspection starts, you can analyze the Input and Output messages for the individual components in the Data Preview console. On selecting a component, you can see its input and output in the data preview window. You can select all the components and inspect data, by selecting the Select All Component box or selecting all the components from the Data Pipeline canvas. By doing so, output of all the components will be visible with component names on top.